inter airport China, which has been known as the No.1 exhibition of domestic airport equipment by the industry, has successfully held eight editions in Beijing, witnessing the rapid and healthy development of our national airport construction in the past 14 years. 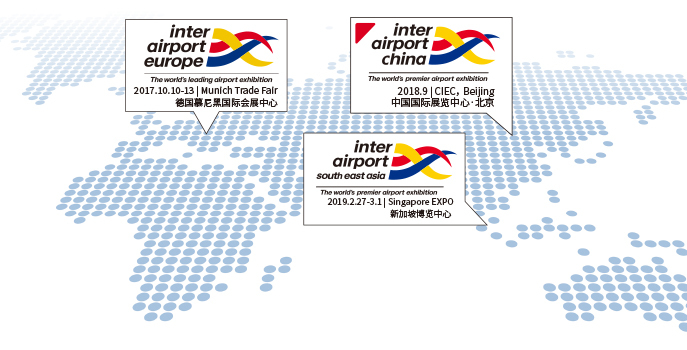 As the largest and most influential airport construction specialization exhibition in the Asia-Pacific Area, inter airport China has now become an international event in the field of technology, equipment, and services for in-depth cooperation between the supply and demand parties and the development of airport construction in the region. Meanwhile it is also the sister show of inter airport Europe and inter airport South East Asia. A total of 4,314 industry buyers filled the aisles at the latest edition of inter airport China. In what was already a record-breaking edition in terms of exhibition space, equating to a 19% increasing on the exhibitor number, 22% increase on the visitor number and 20% increase of the net area of booth compare to the 2016 show. At the exhibition, you can see the most innovative products and the most advances ideas brought by 240 enterprises and brands from 20 countries and regions, while you can also see decision makers from the top 50 airports and major airlines. This fully demonstrates that inter airport China not only establishing a platform for exchanges and cooperation between domestic airports and world-renowned airport equipment suppliers, but also plays a positive role in promoting the construction and development of China's civil airports. In order to enhance your participation experience with us, we provide the following services to all of our exhibitors. Mack Brooks Exhibitions Group builds and owns business-to-business events, in specific sectors worldwide, by bringing buyers and sellers together in dedicated marketplaces. Established in 1965, the company now employs 200 staff worldwide and operates staffed offices in the United Kingdom (Headquarter), Germany, United States, China, Brazil, India, Mexico, Thailand and Turkey. The company owns and organises more than 50 events around the world, many of which are the leading international shows in their sectors. The portfolio of events currently includes sheet metal working, airport technology, rail technology, traffic management, construction, tunneling, waste management, recycling, water technology, fastening and fixing technology, specialty chemicals, corrugated and carton manufacturing, paper, film and foil converting, printing and packaging. In the past 10 years, Mack Brooks Exhibitions has organised total 160 international events with a total of 50,370 exhibitors, attracting 1,280,760 visitors from over 102 countries. Momberger Airport Information is the independent source of information for airport professionals around the world, published biweekly since 1973. It provides unbiased news free of advertising. The newsletter is published in a modular format that allows subscribers to put together their own newsletter package that matches their professional interest in the airport industry.